In this report, we describe a patient who presented with transient acute abdomen before the onset of an acute myocardial ischemic event. Chest pain, dyspnea, and hypotension requiring vasopressors developed 2 days after the patient presented with paralytic ileus. Transient left-bundle-branch block and mildly elevated troponin and brain-natriuretic peptide levels occurred. Echocardiography and left ventricular angiography revealed extensive periapical akinesia and a left ventricular ejection fraction of 35% that soon returned to normal. This case illustrates the possibility that a common mechanism may help explain both transient functional events. We believe this presentation scenario could occur more frequently than usually assumed and should prompt further investigation in this regard. The etiology and pathogenesis of Takotsubo transient cardiomyopathy (TTC) are still unclear [1-4]. Because "systemic endothelial dysfunction" could potentially be part of the causative mechanism by way of coronary spasm, any evidence of coexisting noncardiac manifestations of endothelial dysfunction in patients with TTC is of special interest and could indicate the need for further clinical studies. The present case report lends initial support to the newly offered hypothesis that endothelial dysfunction (precipitated by neurogenic, humoral factors, or catecholamine surge) could be a systemic dysfunction that may simultaneously affect multiple organ sites. An 82-year-old woman presented to her community hospital emergency department with new-onset abdominal pain, nausea, and vomiting. She had a history of hypertension and hyperlipidemia but not of coronary artery disease (CAD). Her overall health was good, and she was under no mental stress. Several weeks earlier, she had been incidentally found to have a lesion on her right kidney lesion that electively required a final histological diagnosis. She was admitted to the community hospital with an initial diagnosis of acute abdomen and probable partial intestinal ileus. A computed tomography scan of the abdomen confirmed the diagnosis of paralytic ileus. A nasogastric tube was inserted, and pain medication was administered. All gastrointestinal symptoms resolved within 2 days, but then the patient experienced sustained chest pain, hypotension, and dyspnea, for which she required intravenous vasopressors (moderate-dose dobutamine) and furosemide. An electrocardiogram revealed incomplete left bundle branch block in regular sinus rhythm at 80/minutes. Cardiac enzyme evaluation showed mildly elevated troponin levels, which peaked at 1.07 ng/mL on day 3. Brain natriuretic peptide level was significantly but transiently increased (peaking at 850 ng/mL). An echocardiogram showed extensive apical ballooning, with symmetrical extension around the apex. Because an ongoing acute anterior infarction was suspected, the patient underwent coronary and left ventricular angiography about 18 hours after onset of chest pain, even though the chest pain had subsided (Figure 1 and Figure 2). The left ventricular ejection fraction, which had previously been normal, was 35%. The only coronary abnormality was a proximal CAD lesion of the left anterior descending artery (LAD), which was asymmetric, ulcerated, and considered the cause of the clinical presentation by the treating physician. The LAD reached the apex but did not "wrap around" it (did not reach the infero-apical and mid-inferior akinetic segments). The initial diagnosis was a large antero-apical myocardial infarction (although troponin elevation was mild), and a single, direct stent was deployed at the LAD lesion with excellent results. The patient's recovery was uneventful, and she was discharged home on day 6, on daily clopidogrel (75 mg) and aspirin (81 mg). A month later, she came to our institution to be cleared for elective kidney surgery. Her medical chart and cine-angiogram from the community hospital were reviewed. 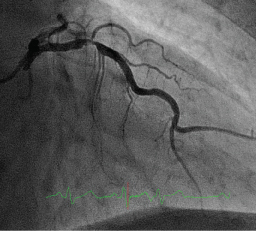 The diagnosis of likely TTC was considered on the basis of the following findings: 1) Angiographic stenosis was not severe enough to justify being the cause of an acute large myocardial infarction; 2) Her troponin levels were much lower than expected for an extensive, de-novo infarction; 3) Apical akinesia extended beyond the LAD territory (Figure 2); 4) The cardiomyopathy was quickly and totally reversible, and at 1-month follow-up evaluation the left ventricular ejection fraction was 65%; 5) Myocardial positron emission tomography scan showed no evidence of scar at 1 month. She declined testing for endothelial dysfunction (to confirm the diagnosis of TTC and to evaluate the chances of recurrent TTC by acetylcholine testing). She underwent left nephrectomy that excluded malignancy. She continues to be asymptomatic for both enteric and cardiac issues 4 years later. We believe that the patient's history, initially considered to involve routine independent events, may actually suggest that she had both transient paralytic ileus of the small intestine and most likely TTC complicating CAD of the LAD. The ileus, transient but definite, was the first clinical manifestation. The specific cause of the event could not be determined (as is usually the case in this pathology) but may have been transient bowel functional ischemia. On the other hand, no definite predisposing or precipitating factors for TTC were established. The LAD ulcerated plaque was neither occlusive nor a source of visible distal embolism on coronary angiography (that would have caused only a small apical akinesia). Thrombolytic agents were not used. LAD stenosis per se could not have caused transient extensive apical ballooning, while CAD could indeed coexist in patients with TTC events, contrary to what is sometimes claimed by some investigators [3,4]. In particular, according to the Mayo Clinic criteria, ulcerated plaques were considered to be an exclusion factor for TTC , but likely this was a practical decision made by early investigators of TTC to eliminate confounding factors of CAD-related myocardial dysfunction when attempting to establish the nature of TTC. We believe that our case involved TTC (the typical apical variety), even though the patient also had a clearly ulcerated plaque and some degree of stenotic effect, but not a total occlusion. The notion that CAD "prevents" TTC is not based on sound evidence, and many investigators have described a distinct proportion of TTC patients who have significant but incidental and unrelated CAD [5-7]. The only method of experimental reproduction of TTC was published by our group  in the context of acetylcholine testing of endothelial dysfunction under echocardiographic monitoring; in similar pilot series, TTC frequently recurred simultaneously with extreme and diffuse coronary spasm in the affected area, which was always promptly relieved by intracoronary nitroglycerin [2,7]. In the absence of clinical evidence of transient coronary occlusion or the effective use of thrombolytic or angioplasty recanalization, our group and others do not consider a non-total or an ulcerated plaque to be an exclusion criterion for TTC diagnosis, especially when the LAD-dependent territory is not large enough to explain the extent of new-onset, rapidly reversible left ventricular dysfunction. We do consider the following factors relevant and frequently conclusive in borderline cases: 1) Inconsistency between the TTC area of akinesia and the related coronary artery-dependent myocardium; 2) Inconsistency between the peak cardiac enzyme and brain natriuretic peptide levels, and the extent of the area of depressed myocardial function; and 3) Resolution of left ventricular dysfunction in a few days, as seen in the present case with the absence of permanent scar on positron emission tomography or late gadolinium enhancement by magnetic resonance imaging. In the context of TTC, the reported incidence of abdominal pain with nausea and vomiting, along with a computed tomography scan positive for (transient) paralytic ileus, ranges from 0% to 10% [3-6,8-10]; this variability is likely due to different degrees of diligence and interest in recording noncardiac symptoms in TTC case series. Interestingly, in general registries, vegetative symptoms (nausea and vomiting, mostly) are present in more than 50% of TTC cases [8,9]. However, a clear theory of spastic etiopathogenesis of paralytic ileus has not been presented in the literature or even mentioned as a possibility before. This should be considered, though, especially in light of recurrent case reports like Guo and Chou's , and because of the 1.7% of 5,274 Japanese patients reported to have had "acute abdomen" at the time of TTC presentation . Still, the potential exists that TTC is indeed caused by 1 or more precipitating factors in individuals who have predisposing conditions (especially endothelial dysfunction) [6,9,11]. In this context, the possibility exists that the mesenteric arterial territory could be prone to concurrent spastic manifestations (at macro- or microvascular levels), especially when precipitating factors are active (eg, pain, anxiety, stress). In conclusion, in this thought-provoking report, we have alerted investigators to the possibility that a wider spectrum of this perplexing pathology may exist, by suggesting the existence of potentially revealing extra-cardiac coexistent vasculo-spastic pathology . Obviously, more specific and prospective research is needed to confirm our concept in a larger series. It is essential to establish objective evidence of endothelial dysfunction as a substantial condition predisposing to the tendency to TTC (eg, by acetylcholine testing). Angelini P (2008) Transient left ventricular apical ballooning: A unifying pathophysiologic theory at the edge of Prinzmetal angina. Catheter Cardiovasc Interv 71: 342-352. Angelini P (2008) Tako Tsubo, where everything can be variable: Or can it? The quest for solid grounds in a slippery entity. Europace 10: 1359-1360. Bybee KA, Kara T, Prasad A, Lerman A, Barsness GW, et al. (2004) Systematic review: Transient left ventricular apical ballooning: A syndrome that mimics ST-segment elevation myocardial infarction. Ann Intern Med 141: 858-865. Ibanez B, Navarro F, Cordoba M, P MA, Farre J (2005) Tako-tsubo transient left ventricular apical ballooning: Is intravascular ultrasound the key to resolve the enigma? Heart 91: 102-104. Guo CC, Chou NS (2017) Takotsubo cardiomyopathy in a patient with ileus: A case report. BMC Cardiovasc Disord 17: 266. Sanchez-Jimenez EF (2013) Initial clinical presentation of Takotsubo cardiomyopathy with-a focus on electrocardiographic changes: A literature review of cases. World J Cardiol 5: 228-241. Vittala SS, Najib MQ, Click RL, Fortuin FD, Chaliki HP (2012) Left anterior descending coronary artery stenosis: In a patient with takotsubo cardiomyopathy. Tex Heart Inst J 39: 125-128. 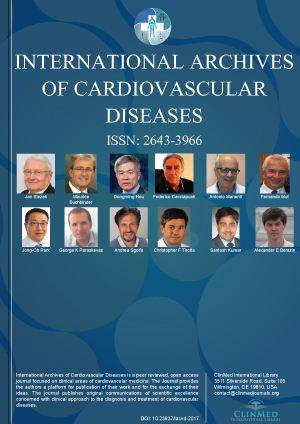 Isogai T, Matsui H, Tanaka H, Fushimi K, Yasunaga H (2018) Clinical characteristics of patients with Takotsubo syndrome diagnosed without coronary artery evaluation: A retrospective nationwide study. J Cardiol 71: 268-276. Templin C, Ghadri JR, Diekmann J, Napp LC, Bataiosu DR, et al. (2015) Clinical features and outcomes of Takotsubo (stress) cardiomyopathy. N Engl J Med 373: 929-938. Verna E, Provasoli S, Ghiringhelli S, Morandi F, Salerno-Uriarte J (2018) Abnormal coronary vasoreactivity in transient left ventricular apical ballooning (tako-tsubo) syndrome. Int J Cardiol 250: 4-10. Paolo Angelini, MD, Department of Cardiology, Texas Heart Institute, 6624 Fannin, Suite 2780, Houston, Texas, USA, Tel: 713-790-9401, Fax: 713-790-0353. © 2018 Angelini P, et al. This is an open-access article distributed under the terms of the Creative Commons Attribution License, which permits unrestricted use, distribution, and reproduction in any medium, provided the original author and source are credited.